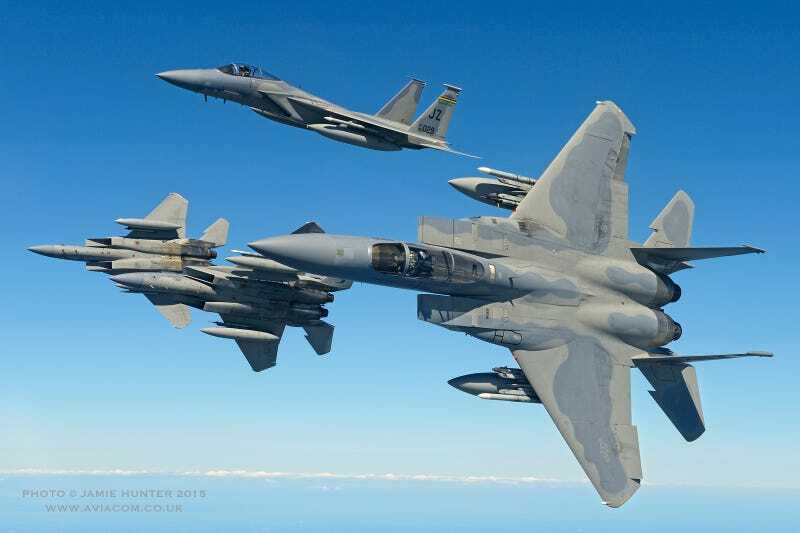 Our friend and editor of the renowned Combat Aircraft Monthly, Jamie Hunter, recently took to the skies The Big Easy in an F-15D with the 122nd Fighter Squadron. As you can see, the photographic results of his adventure are stunning. Based at Naval Air Station Joint Base New Orleans, the 122nd Fighter Squadron are part of the 154th Fighter Wing of the Louisiana Air National Guard, also known as the Bayou Militia. Like all other Air Guard F-15 Eagle units, the 122nd FS is primarily tasked with watching over the skies near America’s borders. At all times a number of 122nd F-15s sit alert, armed and ready to scramble to intercept everything from wayward private pilots to incoming cruise missiles. Yet with the USAF’s massive drawbacks in force structure over the last decade, Air National Guard F-15 units are now more front-line oriented than ever before. Of the eight non-training and development oriented American F-15C/D units, five belong to the Air National Guard. As such they can be called upon at a moment’s notice to fight overseas. An ongoing F-15C/D upgrade path that includes the incredibly powerful APG-63V3 active electronically scanned array radar, the most powerful fighter radar in the world, makes the Eagle a relevant and deadly weapon well after 40 years since its first flight. Many other upgrades are also planned to keep the vast majority of the existing fleet of F-15C/D Eagles, known as “Golden Eagles,” viable for decades to come. These photos are just a taste of what will be in the upcoming USAF Air Power Yearbook special edition of Combat Aircraft Monthly. So if you are not already a subscriber, fix that problem immediately by going here. A big thanks to Jamie Hunter for sharing these awesome images and make sure to check out his personal site here.